At the beginning of the year DATRON AG invited to the first DATRON Tech Day in Mühltal. Exciting short presentations, the entire product portfolio as well as current trends and developments in aluminium milling machining were the focus of the event. Around 170 visitors experienced numerous technology highlights at the DATRON Tech Day, including the presentation of the brand-new high-speed milling machine DATRON MXCube for demanding industrial applications. The participants from Germany and abroad took the opportunity to convince themselves of the efficiency and variety of the machining possibilities of the DATRON product portfolio and received exclusive information about the latest technologies of the experts from Southern Hesse. In addition to the unveiling of the MXCube and the associated sales launch in Germany, the highlights of the day included the keynote lecture by Prof. Dr. Abele, Head of the Institute for Production Management, Technology and Machine Tools at Darmstadt Technical University, as well as other entertaining specialist lectures. "The new DATRON MXCube stands for highest dynamics and precision. It is tailor-made for the special needs of customers in the industrial production environment and thus rounds off our DATRON product portfolio on the machine side", commented Thomas Frank, Member of the Board of Management for Sales and Marketing, on the sales launch of the high-speed production solution. 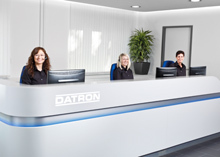 In addition, the Tech Day offered insights into the targeted further development of proven DATRON technologies, such as the connection of automation solutions, which was demonstrated live on the DATRON M8Cube. In the table-top exhibition in the DATRON Technology Centre, renowned industry experts from the fields of CAD/CAM, clamping technology and material supply, among others, were available to visitors for individual consultation. "We were once again able to successfully demonstrate our customer- and solution-oriented "one-stop shopping" approach. As a mechanical engineering expert with our own tool production, high-quality accessories and an efficient after-sales service, we supply our customers with the complete process chain for economical production. We are delighted about the extremely positive response to our Tech Day and look to the future and the upcoming events in DATRON's anniversary year full of zest for action," says CEO Dr. Arne Brüsch, taking stock of the event.